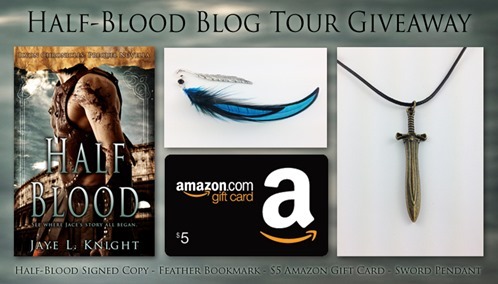 Book Thursdays: Half-Blood by Jaye L. Knight Review + Author Interview! Yay!!!! The day I have been waiting for has finally arrived!!!! 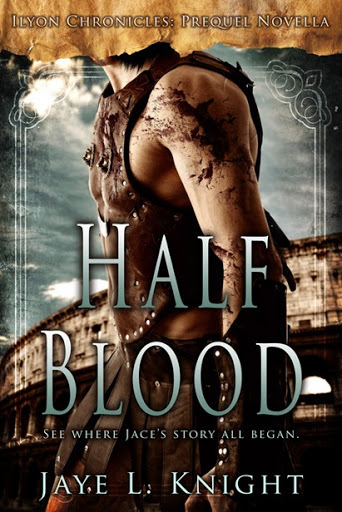 In this post, I’m reviewing Half-Blood and interviewing Jaye herself. But first, about the book! 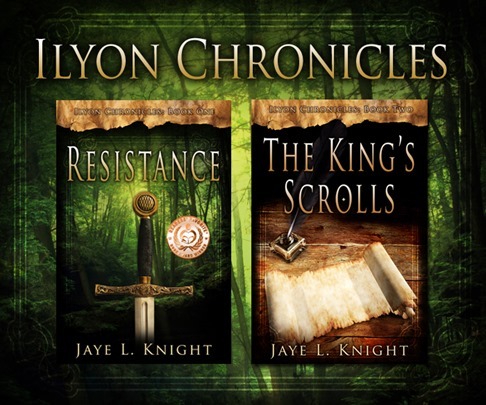 Learn more about this prequel story to Ilyon Chronicles and make sure you also enter the tour giveaway at the bottom! All his life, Jace has been a slave. He has been forced to become a gladiator, and treated so harshly, lower than an animal. Little does anyone know, Jace – as half ryrik and half human – has a heart, a soul, and he is not truly defined by his ryrik blood. He is not an angry killer; he is only thought to be one. And he is treated for the first 17-20 (or so) years of his life as though he is less than worthless. Oh my. I can’t really in good conscience say that I loved or enjoyed this book. I can say, however, that I’m glad that I read it. I’m glad that I know Jace’s backstory, even though it tore my soul to shreds. It shredded my heart into a million tiny fractals. It tore my soul to unrepairable shreds. It emptied my being of hope. It made my heart scream, and cry, and panic out of desperation. I was treated lower than an animal. I was abused for the love of money. I was alone. Forsaken. Rejected. Forgotten. Betrayed. Sold. Broken. Hopeless. And I never believed I could ever be loved, or even treated like I was even half-human. I never believed I could ever have a soul. *cries* Oh yes, I cried. Out of anger, pain, and more injustice. Throughout this book, we dig deep into Jace’s past. We see his loneliness, heartbreak, struggle, and his (yes) humanity. We see that he is not heartless, and isn’t completely overcome by his ryrik blood. Though he has many challenges, he does not give up. My favorite part of the book was the second half, of course. It was so amazingly full of hope. The horrible hopelessness of Jace’s life of slavery made hope – when it came – so much brighter, in contrast. It was so beautiful. I won’t give too much away, but the end of the book overlaps with the beginning of Resistance, from Jace’s point of view. It’s like reading an awesome book for the first time – twice. Because even though I knew what would happen, it was totally new, with the same dialogue and scenery. That was amazing. So yeah, I’m glad I read it. Was it hard to read? Oh, you’d better believe it. But seeing Jace’s past helped to give me a glimpse of who Jace is and who he is becoming. Though this is a prequel novella, I don’t think I would recommend it as a starting point for the series. Although it is written extremely well, it’s tough to read and perhaps not as enjoyable until you’ve read Resistance. It is heartbreaking, and not as “lovely” as the other books, but it is definitely a worthwhile read when wanting to know even more about Jace’s past. I received an eARC for my honest and unbiased review. Thank you, Jaye! 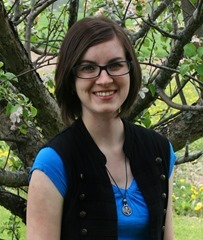 As I promised, I got to interview the author, Jaye L. Knight, and share her answers with all of you. Jaye, did you find Half-Blood to be hard to write? I know that for me, it was difficult to read at a lot of points. The entire first half, actually. Surprisingly, this story was one of the easiest I’ve written, not because of subject matter, but it just flowed really well. I’m glad of that. I wouldn’t have wanted to labor over it for a long period of time. I was able to write the whole thing in just a couple of weeks. 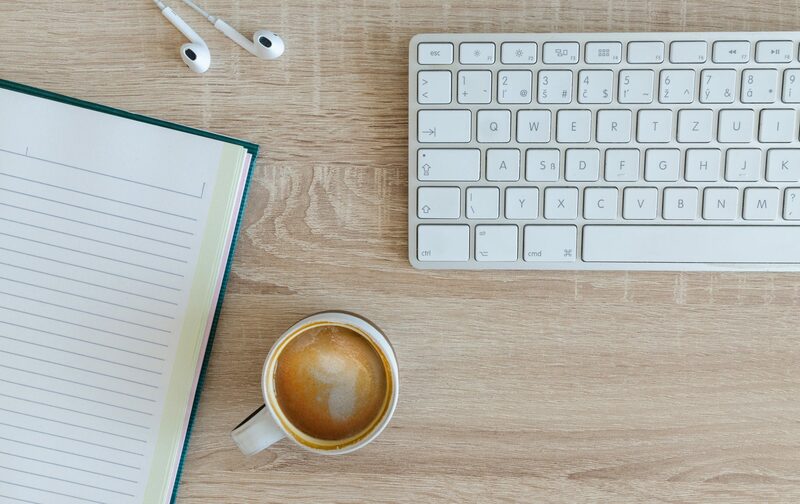 Do you enjoy writing about just Jace, or would you rather work with multiple storylines (as you do in the rest of the Ilyon books)? I love writing about Jace. While I do enjoy working with multiple storylines, Jace is my favorite to work with. Though, there are a few others I particularly love writing as well, like Trask and Prince Daniel. And I love reading about Jace. He’s such a relatable character, especially to me. Trask and Prince Daniel are such fun to read about too, with their great witty and strong personalities. Where did your ideas for Jace’s story come from, especially the details of his life as a gladiator and slave? Originally, Jace was inspired by a half-blooded character in Donita K. Paul’s DragonKeeper Chronicles books. I didn’t discover that Jace was a gladiator, though, until I was quite far into writing Resistance. I always knew he was a slave and struggled with his ryrik blood, but the gladiator idea came from a History Channel documentary on gladiators that I randomly watched with my brother. I found it so fascinating that my imagination took over, and next thing I knew, Jace’s entire backstory changed. That is so interesting! Thank you for sharing with us, Jaye. Previous PostPrevious Rebel is Not a Synonym For Teenager. Next PostNext So, You Thought It Would Be Easy?